Today is all about beginnings. A new year. A new president. Hope that anything is possible (at least for today!). In the midst of all this enthusiasm it seems appropriate to begin my own humble venture…roxx.com. No more procrastinating or waiting for the perfect time. No excuses. If President Obama can take on a failing economy and two wars in addition to the usual presidential duties, I can certainly take on a blog! So thank you Mr. President… for giving me the kick I needed and also for inspiring my first column. As a designer I admit that I was under the Obama spell the first time I visited barackobama.com. I still use this site as an example to clients (no matter their politcal leanings) of the power of web 2.0 and of good design. It is clean, elegant, and inspirational and reflects the man it represents. It runs efficiently, has depth of content and connects to me through personalized content and email campaigns. It tows the line between being something bigger than me and something I am a vital part of. I should have known this guy was serious when his campaign proved to be serious about typefaces. The signature font –Gotham–is none other than the work of respected typeface designer Tobias Frere-Jones. Frere-Jones did his research for Gotham by looking at vernacular lettering in New York City starting at the Port Authority Bus Terminal. It is a typeface that is clean, bold and elegant yet also carries history and meaning for it’s subject. (Adam Tschorn of the LA Times explores the use of this font in his article “The Character Issue”. Once the Obama campaign identity was firmly in place, they did something novel.. they asked us to participate in the design process. They asked the public to take the logo and design a t-shirt for the campaign. The amazing thing about this contest was that by signing up, anyone could download a full design asset package that included the Adobe Illustrator file of the logo with all the layers intact to play with as we saw fit.. how crazy is that? Not only could we wish we had designed the logo, but now we could dissect the various layers and blends that created it and make our own variations. Talk about transparency. Wow. Ok… maybe only exciting to a design geek like me, but pretty cool none-the-less. Playing around with various designs for a T-shirt made me feel that I was somehow contributing to the campaign…and felt lucky to be in such good company… the quality of designs submitted was pretty impressive. 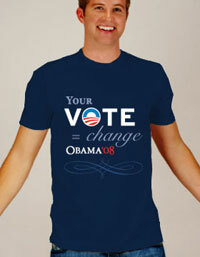 The campaign went far beyond inspiring T-shirt designs. There is actually a whole section of the site called Runway to Change devoted merchandise created by various fashion designers. 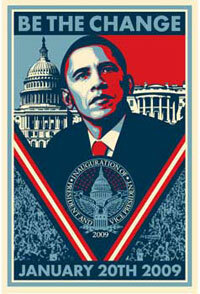 There is also an Artists for Obama section which includes the now-famous poster by street artist Shepard Fairey. I have to admit that I resisted the many emails asking to send more money after Obama had won but I broke down with the offer of poster by Fairey if I contributed just $25 more. (A side note for you Bostonians: Fairey will be featured in an exhibition at the ICA starting February 6th. – a chance to explore Fairey’s career and a terrific new building in Boston designed by Diller Scofidio + Renfro. The Obama identity seems to be carrying over into other presidential ventures. Once Obama got elected, his design team clearly took over the DNC website and The Presidential Inaugural Committee website. I can’t wait to see a new White House site! If Obama is as masterful in running the country as he has been in running his identity campgaign I can only hope for good things from this president and for the future of design. Congratulations and welcome to the blogosphere. I’m a type geek too and Gotham is terrific face. I didn’t know the history, so thanks for that. Knowing your penchant for good food and interesting travel I look forward to further installments. Looks like the Obama website design team was working overtime. The new White House site went up at noon today! Really cool article. I find the concept of designing ones identity in a concious manner very interesting. We all do it on one level or another mostly unconciously by choices we make- which can lead to very interesting results in people’s perceptions of us- but to create a specific identity via the web is another beast entirely. Great analysis Betsy- I appreciate your geekiness.